In Arctic Apples, the enzyme polyphenol oxidase (PPO) – the substance which causes apples to turn brown – has been shut down. 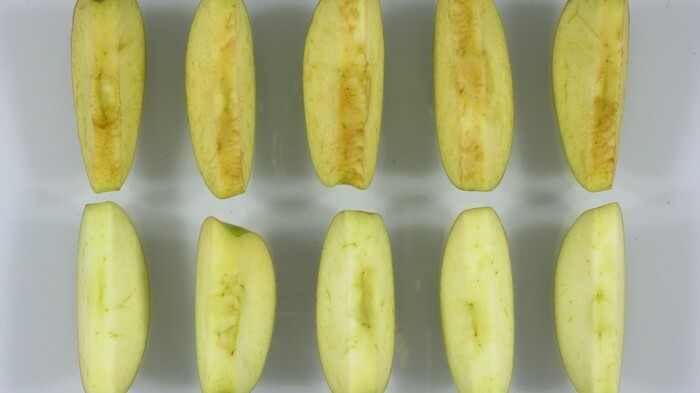 In regular apples, slicing or bruising the fruit causes PPO to react with chemicals in the fruit (polyphenolics), giving it the browning effect we’re so accustomed to. PPO is found in a number of plants, and serves as an evolutionary defense against herbivorous insects, so it will likely be sprayed heavily with pesticides. The altered apples can take up to 3 weeks to turn brown, which Okanagan Specialty Fruits says allows the company to sell them at a cheaper price than traditional pre-sliced apples, as 35% of the cost of the regular variety goes to applying a flavor-altering, antioxidant treatment. The GMO apples are also supposedly crisper and more packed with antioxidants than non-GMO apples. The company currently manages 85,000 apple trees in Washington state, but Okanagan plans to expand to 300,000 trees this spring, with a half-million trees going into the ground in 2018. The fall 2017 crop is expected to produce 6,000 more boxes of Arctic Apples for the Midwest region. Last February, Canadian fruit growers asked the B.C. Fruit Growers’ Association to de-register Arctic Apples until further studies could be conducted. Gerber and fast-food giants McDonald’s and Wendy’s have said they will not sell the GMO apples.